Dr. Swamy in his letter has pointed out 4 specific examples which according to him showed “poor judgment” of the Government’s law officers. Swamy said the government took a stand against section 66A of the IT Act which was struck down by the court, and that this shocked all those who took pride in India being a democracy. He added that the Government’s stand attracted criticism from international organizations and was against the International Covenants on Civil and Political Rights which India ratified during the Janata party rule in 1979. Dr. Swamy also found fault with the Attorney General being critical of the judges selected under the Collegium in the hearing on the NJAC matter before the Supreme Court. Dr. Swamy complained that personal remarks about lady judges have been badly received by the Bar. He also complained that the Government proposed Judicial Appointments Commission as an alternative to the Collegium system has not been debated in any forum of the BJP and ‘appears to be arbitrarily unreasonably conceived idea.” He said the stand taken by the Government has angered collectively the judiciary and in particular the Supreme Court. 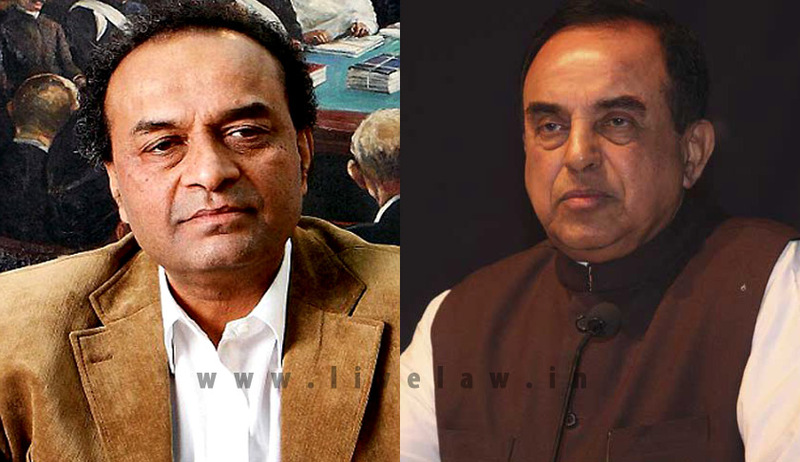 Swamy said that through a newspaper leak he has learnt that the government will oppose his writ petition seeking to decriminalise the defamation law. He pointed that the international trend today is in favour of decriminalizing defamation. "As in the case of Section 66A of the IT Act, the Supreme Court made disregard to the government of India and could go ahead to quash the said section as unconstitutional," he said. According to this TOI report ‘Centre, in an affidavit submitted before the apex court on Saturday, justified criminal defamation saying these are 'efficacious remedies to deal with growing tendency to defame people'. Rejecting the petitioners' argument that there was a civil remedy for filing a defamation suit, the government noted that 'civil remedy is not an efficacious remedy'. Dr. Swamy also complained that the Attorney General was seeking repeated adjournments in the SLP filed by him seeking provision of amenities for Ram bhaktas who come in lakhs every year to Ayodhya to have darshan of Ram lala in the makeshift temple permitted to be erected by the Supreme Court vide its Constitution Bench judgment in 1994. Dr. Swamy urged the Prime Minister to direct the Law Ministry to file an affidavit in the matter by July 25 so that he could get favourable orders for the benefit of Ram Bhaktas in the first week of August when the case would come up for hearing. Dr. Swamy warns the Prime Minister in his letter dated July 9, 2015 that the trend and inclination of the law officers could get the Government a bad name in public just as Indira Gandhi got during the emergency imposed between 1975-1977.